ETC’s Layers of Light Theatre proved once again to be a hugely popular attraction at this year’s Prolight + Sound, with visitors standing off the stand and on tip toes to see the two different presentations. 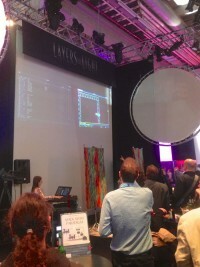 The first presentation demonstrated how each of the different types of fixtures – tungsten, HID and LED – can work well either individually or together as instruments in a lighting director’s tool box; while a second showed how easy it is to set up a lighting system for a gig, making use of the new Magic Sheets function on the control desks and RDM technology, and demonstrating how ETC control desks, fixtures and power control products work together. Everyone who attended both presentations as well as a personal demonstration of any ETC product was entered into a draw to win a Source Four Mini. The winners were announced following the show as Markus Fuchs, Jan Lemmenmeier, Marcus Schindler and Aske Skovsted. Also on show was Eos Titanium control desk (known as Ti), which takes the place of ETC’s flagship Eos at the head of the product line. With new hardware and features that make designing and programming even easier, the desk was busy from the very beginning of the show. Sarah Clausen, market manager for ETC GmbH says: "We had an amazing response to the new control desk, which, really impressed with its integrated, articulating, multitouch displays, backlit keys and anodised finish. "The new Eos v2.0 software was loaded onto the Ti, enabling users to see the new Magic Sheet function, which lets users set up customised, interactive live/blind displays. Eos v2.0 also revises and improves the way Eos handles RDM for compatible devices." Also on display and commanding attention was: a sneak previews of PC Congo – PC-based lighting control software for the Congo family; Source Four LED Cyc, a new LED fixture specifically designed for cyc lighting; Source Four Mini, a palm-sized 50W powerhouse; Source Four LED Studio HD, optimised for on camera white light; ES1 Dimmer, providing on board dimming for any brand theatrical luminaire.